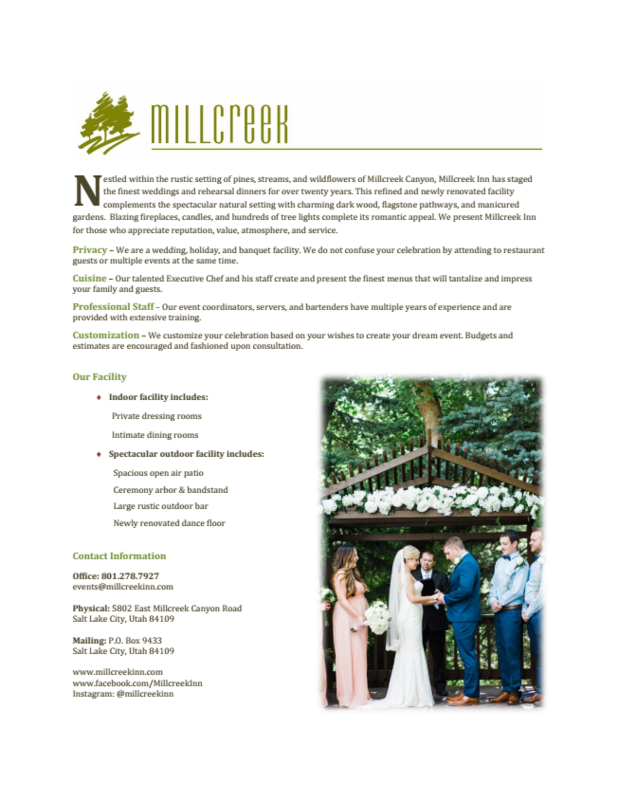 Millcreek Inn is a wedding venue and event facility held in the rustic setting of Millcreek Canyon. As an event center and outdoor wedding venue in Salt Lake City, UT we offer full catered meals and banquet bar service. Our facility can house up to 250 guests, allowing you to have the flexibility of planning an intimate wedding ceremony or a large corporate party in Salt Lake City with coworkers and associates. We have two indoor wedding reception and banquet halls and an outdoor patio that can be used for buffets, dessert tables and an outdoor bar. Our wedding chef is well-recognized throughout Utah and beyond for his inventive use of ingredients, presentation and flavor. Executive Chef Valenzuela combines fresh ingredients with modern, traditional and ethnic flare, tantalizing guests and serving them with unforgettable memories of their most special celebration. A student of the Culinary Institute of the Arts in New York City, Chef Valenzuela has entertained the likes of Olympic dignitaries, corporate executives, local politicians, charity groups, exquisite weddings, and banquet celebrations. Chef Valenzuela will customize your wedding, banquet, corporate retreat, or any other event to embody your culinary desires. From lighter wedding reception appetizers to the panache of four course tasting ideas, our menus incorporate fine cuisine with affordability, choice and creativity. Our professionally trained kitchen and wait staff welcome the task of providing your guests with impeccable service. Elegant food presentations include wildflowers and greens, candle trays and floral arrangements. Millcreek Inn offers a catered menu service that is flexible and customizable to your party’s needs. Ethnic, vegetarian, and dietary requests are welcome. Your party’s dining service can include appetizers, dinner plated menus, open buffets, wedding dessert bars, and even custom wedding menus. Get a better idea about the food service offered at our event venue by taking a look at our four course tasting menu photos. An appetizer service is a delightful option following a wedding ceremony or served during your initial reception gathering as guests arrive. In conjunction with beverage or bar service, the appetizer service permits your guests to converse with each other more freely. It provides an additional source of entertain ment as the wedding party completes photographs and makes introductions. Our appetizer service is both delicious and professional; our appetizer photos will leave your mouth watering. Butler Style appetizers refer to individual canapés or skewers that are delivered to your guests on decorative service platters. *Appetizer service should not be considered as a meal replacement and must accompany lunch or dinner menus. Your guests will enjoy a sit-down service menu, exquisitely prepared by our Executive Chef and his assistants, and elegantly served by our service staff. This is our most popular menu service. Many of our brides and grooms prefer to have their guests served with classic fine dining. With this menu your guests will be served table side, often known as “sit-down service”. This option is the most traditional and offers your guests impressive presentations. View our plated menu photos to see some of the meals we’ve served at past wedding receptions. This menu is ideal for groups that may have guests arriving at different times, or that simply wish to present a more casual celebration. These menus are crafted by our Executive Chef using fresh ingredients and exotic flavors. Take a look at some of our gorgeous buffet menu photos. Millcreek Inn provides full drink services. Our event staff offers multiple types of drink services, including a cash bar, hosted beer and wine service, and hosted open bar. Cash Bar: guests purchase drinks at their own expense. This service includes bartenders and wine,beer, and liquor set-up. Hosted Beer and Wine Service: a complete bar setup; including bartenders. Beer and wine selections are offered to guests based upon a pre-determined menu. The cost is based upon consumption. Hosted Open Bar Service: similar to the hosted beer and wine service, with the exception that cocktails are included. The price of this service is also based upon consumption. Our facility proudly serves local brews from around the valley and a tiered wine list that offers affordability and informed selections. Our complete wedding wine list is available upon request. We offer many unique vintners. You are welcome to submit requests for your reception. A champagne toast is a special way to congratulate the newlyweds. Beverage options for champagne toasts include sparkling wine, champagne, or non-alcoholic Martinelli’s sparkling cider. This service includes a pouring and serving staff. For a better idea about the different drink services we offer, take a look at bar photos of past wedding receptions. Millcreek Inn offers multiple food options and wedding packages. For your convenience, we offer packages including linens, plates and cutlery. Find out more about dining accessories through by checking our rates and availability. Contact us to meet with a wedding consultant, or request an estimate for food and beverage services. We look forward to serving you.